Several times over the past five years, I've tried to explain what labor feels like to Dan. "I just don't get why it hurts so much," he'll say. "It's like a big belt tightening really hard around your whole middle," I tried one time, squeezing my waist and squinting. "That doesn't make any sense," he said, shaking his head. Another time, I told him, "It's like a charley horse! Again and again, though." "I've seen you in labor," he replied, surely referring to the twelve hours of back labor I endured with Shef without an epidural. Or maybe he was thinking back to the thirteen hours of just regular labor I had with Mac, also with no epidural. "I've had a charley horse, and I just don't think that could possibly be an apt comparison," he said. Then yesterday, Dan leaped off the couch, suddenly overcome and unable to speak because of a foot cramp. He made some grunting noises and grimaced, exhaling sharply several times. "That's it!" I said, after the cramp had subsided. "That's like a labor contraction!" "Oh!" he exclaimed. "I get it now!" "Except," I said, "each one is four times as long as that, and they keep coming for hours and hours." "Well," he said, unfazed. "Now I totally understand labor. And look how well I coped with the pain!" "I mean," he continued, "it was hard, but I got through it!" These types of comments continued off and on for several hours, kind of like a long pre-labor. The kind of labor that is sort of annoying, and only reminds you of how much worse it's going to get. And so I tell you, Internet: this is going to be unbearable. As of now, it's just Shef with the official strep diagnosis. He's definitely sick, but he's his own little version of sick. Like yesterday morning, for example, he was lying on the couch looking momentarily pathetic. "You're going to have to stay home from school," I told him, giving his forehead a feel. "Yes!" he cried, perking up. "Can we go to an indoor pool?!" "Uh, no," I said. "You're sick." "Oh, yeah," he said. "Let's draw!" And so we've been drawing Super Diaper Baby and talking about googolplex. By the way, I'd like to thank his buddy Ernie from school for introducing Shef to the concept of googolplex. It's been really great talking about that for the last ten days non-stop. In preparation for the reunion festivities this weekend, I dug out my Camp Foley photo album, which I had painstakingly labeled and organized. And thank God I did! My kids don't have baby books, but we'll all be able to enjoy hundreds of photos of me wearing overalls and looking completely ridiculous. 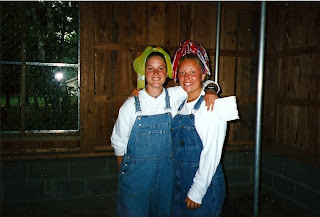 In fact, The overalls were the major theme of all of our Foley albums. There were six of us former counselors in attendance at this reunion, and it's hard to find a single photo that doesn't include at least one person wearing overalls. Anne told a hilarious story about the time her husband Josh had to tell her to stop wearing hers, many years after we'd stopped working at camp. "He said, 'Honey, I don't really see people wearing those anymore. I think those are maybe a little out of style,'" she recounted. Then Emily (pictured above with the pom pom on her head) told the group she'd seen me wear mine during the ninth month of my pregnancy with Shef with all three of the side buttons undone. I did do that. And I also wore them to work. I'm glad I'm not the only one who held on a little bit too long. Here's a video of Shef rocking out with Bruce Springsteen at Super Bowl half-time. This was taken just before he finished the Bud Light that's sitting there on the kids' table. That Bud Light was Dan's. Shef didn't notice me taping at first, but he didn't stop dancing once he did. He likes music. The other day his teacher sent home a photo of a group of girls and Shef acting out High School Musical in the Big Blocks Area. "What part did you have?" I asked him. "Oh, they weren't being very nice," he said, frowning. "I told them I was going to be Chad, but they said I had to be Troy." That's gotta be tough, right? But, still he gave a great performance. And here's a video of Mac eating a disgusting little Gerber food called "Puffs." I call them "poofs" in the video, but that's wrong. I checked the package to be sure. Anyway, I'm oddly thrilled that he can eat these, and now I'll share the experience with you. Mac turned eight months today. Eight months! You know what that means, right? Only four more months of breastfeeding for me. Ever! I'm a a total lactivist, but the truth is, I'm getting tired. Plus, I promised myself all new bras and underwear as soon as I reached the twelve-month mark. I really need those products, people. And four more on top. These days, he's constantly on the move - pulling up and cruising and racing toward particles on the floor. He still loves to chew paper and electrical cords. He still loves to laugh at Shef. His hair gets redder and redder, and his eyes have stayed blue. It's easier to enjoy a second baby, I think. I know how fleeting this baby year is, which makes the hard times a little less hard. Sometimes I tell Mac that he's "my little gift from God," which is so unlike me. I don't say things like that or even really think that way. But, I do feel incredibly lucky. Even at 12 and 2 and 3 and 5 and 6:30. So, last Thursday Mac and I took Shef and his buddy bowling after school. We went to a nice, well-known South Minneapolis establishment. It was fun, and the attendant only had to tiptoe down the ball-return six or seven times to dislodge the ones that got stalled in the gutter. Then, after all the frames were complete, we went back out to the parking lot, where I noticed nothing out-of-the-ordinary. I buckled Mac into his seat, and then Shef, and I was just about to belt the pal in when suddenly, the parking lot was totally full of police. Dogs barking, all exits barred, and guns aimed at the car which had pulled into position directly behind my Outback. I told the kids to duck, but when it became clear that there would be no shooting, they watched the two perps get cuffed and shoved into separate squad cars. Then, I had to answer some questions about bullet-proof vests and the narcotics the cops mentioned when they came over to see if we were all recovered from the trauma. The first week of Earth Day Half Marathon training is in the books, and I have to say, it hasn't been as painful or humiliating as I feared. I even managed a slow five-mile slog along the River Road - my first outdoor winter run in two years. The other workouts were on my bike in the basement or on the treadmill at our gym. We belong to the newly-constructed and totally tricked-out Leonard Center at Macalester College. We joined for next-to-nothing because I'm a member of Macalester's Class of '99. It's not open to the public, so it's the college kids, the faculty and staff, and some alums. There has been maybe one other person over 25 in the fitness center on each of my visits. And that's really the only trouble with the gym: I feel tremendously old and saggy in the locker room, changing with the 18-22 set. Between the stretch marks, the "abs," the craggy double-c-section scar, and the nursing pads that I stuff into my jog bra, it's pretty obvious that one of these things is not like the others.